Most conservatives believe that this third branch of government, the judiciary, was intended by our Founding Fathers to be the weakest of the three branches, subservient to the executive and legislative branches. I am not one of those! Although on behalf of my clients and the public interest, I have had to regrettably fight with many of them over the last 40 years since I became a member of the legal bar, judges in my opinion are, in principle, our most important public servants as they were intended to protect us from the tyranny of government and also ourselves. But this is not how it turned out, however well intended were Washington, Adams, Jefferson, Franklin and their fellow patriots. Sadly, our judges are not the solution to our problems, they are the primary problem, as they generally have come to wear their politics on their legal sleeves and butter the bread and grease the interests of those "special interests" who got them their robes. In effect, we have a Cadillac of a legal system, but for the most part intellectually bereft and dishonest drunken drivers at the wheel. Despite this, I continue to soldier on, hoping that with each new case that I bring, it will find its way to an honest, ethical and courageous judge, one who will adhere to the rule of law and respect our Constitution, and not bow down to the so-called powers to be. Indeed, with federal judges like the Honorable Royce C. Lamberth, who sat on many of my cases by the Grace of God during the Clinton administration, and even ruled that President Bill Clinton had committed a crime when he illegally released the White House employment file of a woman who came forward to testify about his having sexually harassed in the Oval Office, to smear and discredit her publicly, and another, the Honorable Richard J. Leon, who ruled that President Barack Obama's mass illegal surveillance on the American people was "almost Orwellian" and unconstitutional, and then enjoined this illegal conduct, I from time to time have had my faith restored. 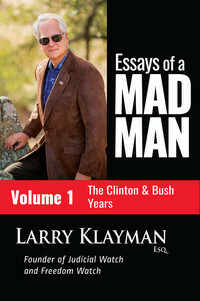 This four volume compilation of my columns over the last decades, which I correctly have titled "Essays of a Mad Man," spanning the years of the Clinton, Bush, Obama, and now Trump administrations, is a testament not just to the frightening evolution of our democracy, but also the potential downfall of our republic. And, it will hopefully stand as a wake up if not clarion call to action, before our republic slips away into an irrevocable and putrid cesspool of corruption in the swamp that our current president described during his successful presidential campaign in 2016. Having miraculously won the White House, the swamp creatures on the left and even in the president's own political party, the Republican establishment "Never Trumpers," have crawled out of their slimy lagoon to try to devour any hope that the citizenry has of a national revival. I for one will not stand by and allow these dangerous reptilians to destroy the vision and creation of our Founding Fathers. I hope that you the reader will dissect and analyze these columns carefully, as the past is truly a prologue. Only by seeing where we have come can we divine and do something about where we are headed as the once greatest nation on earth. And, only with your support and strong fearless participation and enlistment, fellow patriots, in what I can only describe as our Second American Revolution, can we, in effect Gideon's Army, "Make America Great Again!" As our great Founding Father and second American president John Adams declared just days before signing the Declaration of Independence on July 4, 1776, in my native city of Philadelphia, it does not matter how many times we may change our rulers or forms of government, without ethics, morality, and religion, we will not have a lasting liberty. And, an equally great Founding Father and third American president, Thomas Jefferson, also proclaimed a short while after our republic was birthed that when the people fear government, there is tyranny, but when the government fears the people there is liberty! I ask you the reader to be the judge whether "Essays of a Mad Man," and my life's work, holds true to these great principles! 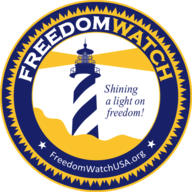 Proceeds go directly to Freedom Watch and support our fight for liberty and constitutional rights.